‘‘ Carlo Brandelli’s creations for Kilgour A/W 2016 are truly extraordinary. Architectural,precise, richly textural & above all immaculately constructed. Brandelli perhaps more than any other contemporary menswear designer is redefining the identity of the suit in the modern world ‘’. and is pairing down his work back to the absolute minimum’’. by slimming it razionalising it and thus sleekening it’’. ‘’ Extraordinary installation in Florence’’. 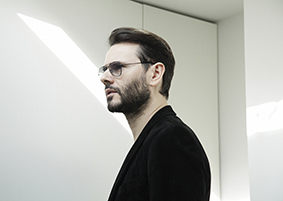 ‘‘Creative Director Carlo Brandelli is a game changer’’. ‘’ His Sensibility is that of an installation artist’’. ‘‘Brandelli is the intellectual’s tailor, the minimalist’s menswear visionary’’. ‘‘The outspoken genius of modern tailoring’’. ‘‘Carlo Brandelli’s objects of devotion - the result is a multivalent, investigative research as formally compelling as it is productive’’. “Permanance reflects the modern and effortless style that he brings to all of his work”. GARTH SPENCER GQ STYLE JULY 2010.
new venture as he presents his debut sculpture exhibition’’. ‘‘Carlo Brandelli Menswear’s High Priest’’. ‘‘What a blow to menswear when he (Brandelli) departed the brand (Kilgour).And that got me thinking about those othergreat design talents in absentia, Heidi Slimane, and Helmut Lang ( I guess we can now throw Martin Margiela in with that group too). If anyone understands the interplay of wearable and interesting,it’s those designers-and they’re all on the sidelines’’. ‘‘The show was a lesson in elegant restraint’’. ‘‘Kilgour’s catwalk debut was a smash’’. ‘‘Creative Director Brandelli speaks with the authority of a prophet’’. ‘’He is a shy poet’’. ‘‘What is modern and elegant is a passion for Brandelli’’. ‘‘The Prince of Savile Row’’. ‘‘Carlo Brandelli’s rigorous sense of taste and detail has made the house Kilgour into a hot property’’. ‘‘Carlo Brandelli creative genius ’’. ‘‘Kilgour hired a groovy young designer Carlo Brandelli, and reaped the benefits of his brilliant re branding’’. that it makes Gucci look like H & M’’. ‘’A designer of exceptional quality and talent’’. ‘‘Design Rigor stamped on every gene’’. ‘‘Carlo Brandelli’s Squire is about as tuned into the zeitgeist as you can get’’. ‘‘One of the most important players in modern British Menswear’’. ‘‘Carlo Brandelli of Squire is the kingpin of London menswear’’. Design right Carlo Brandelli 2019. © Carlo Brandelli.